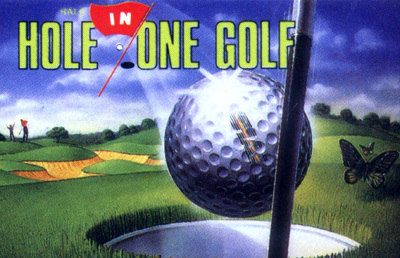 The glorious game of golf finally makes its way to the Super Nintendo with "Hal's Hole in One Golf". You can hit the links in any of the gameplay modes: Practice, Stroke Play, Match Play, Tournament Play, or one-on-one against the HAL Pro. You can go at it with up to three other duffers, and you can use the Handicap option to even the playing field. Players of all skill levels will enjoy this game, because each mode of play has three difficulty settings Amateur, Single, and Professional that offer enough of a challenge to keep you coming back for more. As an added bonus, if you're lucky or good enough to score an eagle, albatross, or a hole in one, you'll get a secret password that will let you replay the shot anytime you want. You'll be able to prove all those shots you will be bragging about to your friends! If you're not quite feeling up to par, "Hal's Hole in One Golf" will make you feel better in no time!